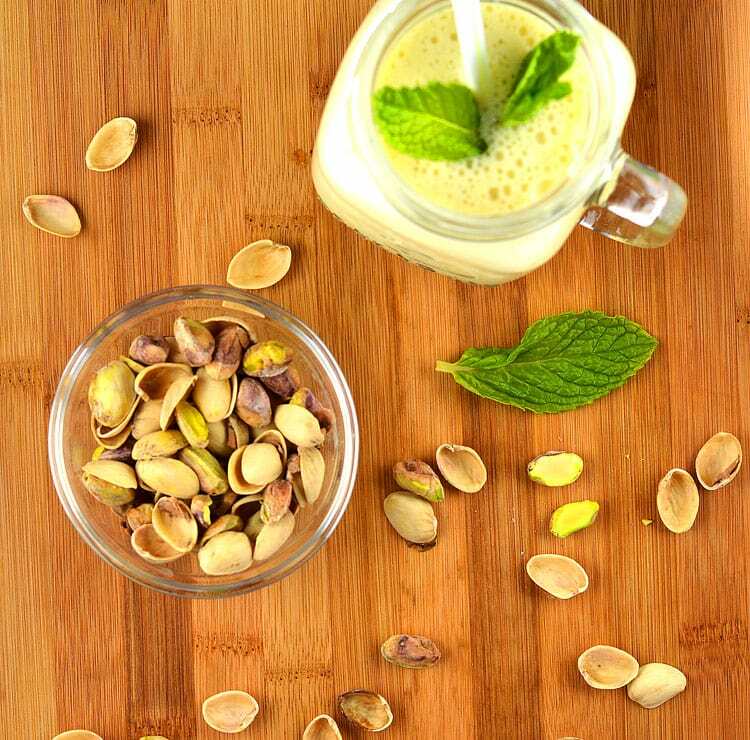 Fool Yourself Full with Pistachios! It’s April Fools’ Day and what better prank than to “fool yourself full”? Pistachios are my favorite nut to snack on, so when I was presented with the opportunity to do this post – I was thrilled to be able to participate. I don’t have a lot time at work to snack, so it’s nice to keep something like pistachios on hand. And like many people, I’m trying to be more mindful of how I eat. I’ll show you just a few of the many pairings with pistachios that create a low-calorie, yet very fulfilling snack. But first I’d like to share with you a few key messages provided by the Pistachio Health Institute to help you learn a bit more about pistachios. 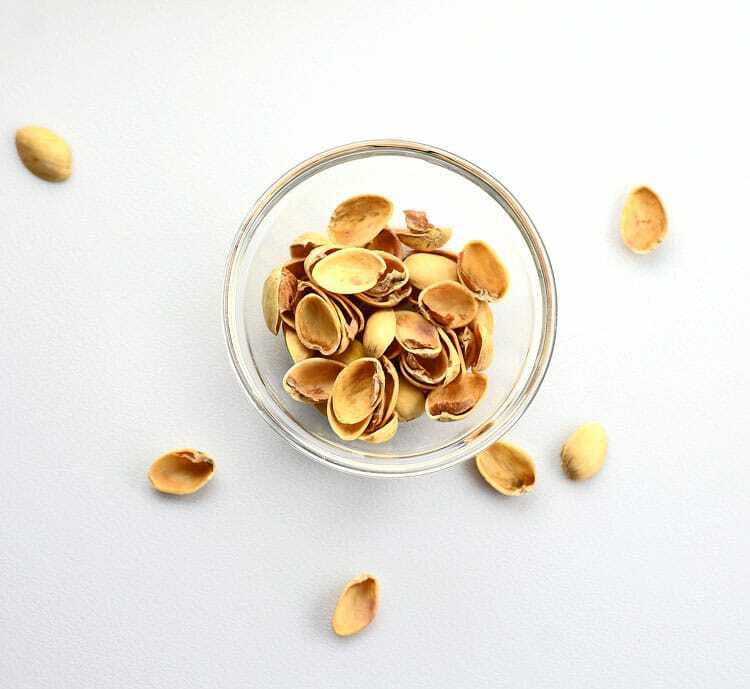 In a second preliminary study – Dr. Painter found that snackers who left discarded pistachio shells on their desk throughout the day cut their calorie consumption of pistachios by 18 percent compared to those who routinely cleared away their nut shells. 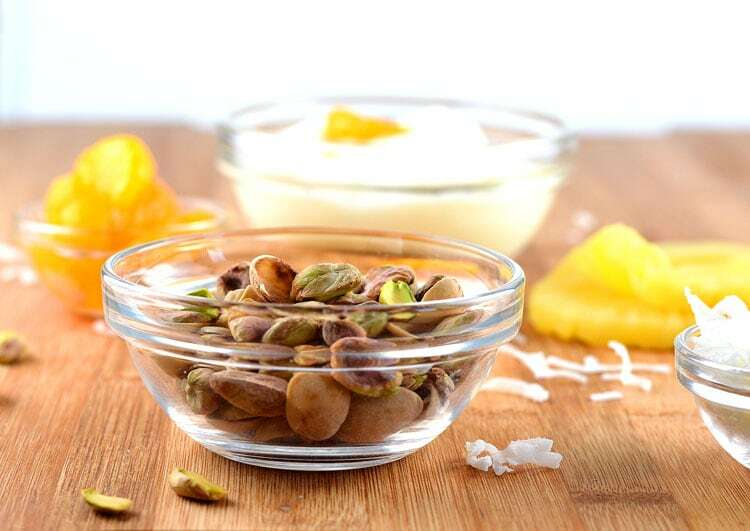 For a healthy snack, you could pair in-shell pistachios with a low-fat vegan yogurt, fresh fruit such as pineapple or mandarin oranges and a sprinkle of shredded coconut. 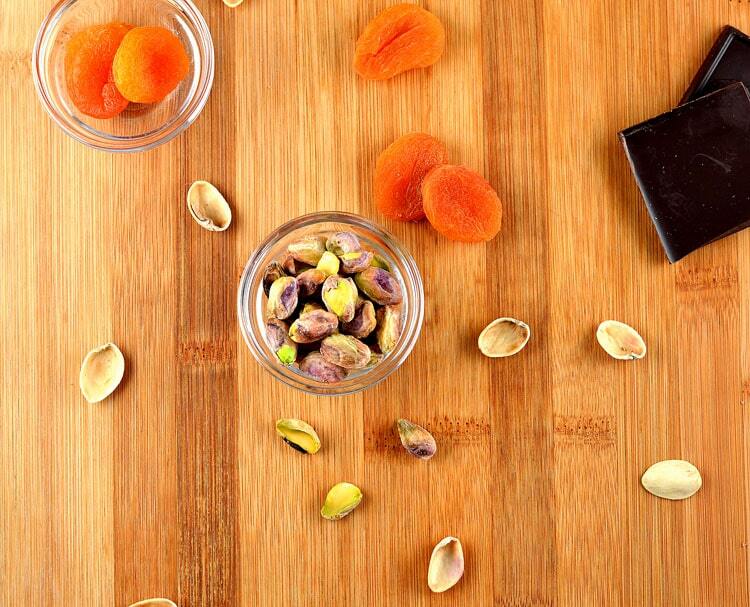 This super simple snack includes our in-shell pistachios, dried apricots and a square of dairy-free dark chocolate. What a great combination! Here’s a quick tip… I like to portion my pistachios out in small zip bags so they are ready to grab when you are on the go. For me it also helps visualize what a snack-sized portion really is. But my favorite way to enjoy pistachios is with a fruit smoothie, such as this pineapple and ginger protein shake. I love the salty and sweet combination. It’s really refreshing and very satisfying. U.S. Department of Agriculture. National Nutrient Database for Standard Reference, Release 27. K. Kennedy-Hagan, J.E. Painter, C. Honselman, A. Halvorson, K. Rhodes, K. Skwir. “The Effect of Pistachio Shells as a Visual Cue in Reducing Caloric Consumption.” Appetite. 2011, 57(2): 418-420. Honselman, C.S., Painter, J.E., Kennedy-Hagan, K.J., Halvorson, A., Rhodes, K., Brooks, T.L., & Skwir, K. “In-shell pistachio nuts reduce caloric intake compared to shelled nuts.” Appetite. 2011, 57(2):414-417. You could win a year’s supply of pistachios! Enter to win at the Pistachio Health Institute’s Facebook page.